Few would ever argue that data is a critical part of business. "If you can't measure it, you can't manage it" is one of the most common refrains. But if that is true, why is there such a high rate of failed and abandoned projects? Why do seemingly well-run businesses get caught unaware when the believed-to-be-good numbers fall away to reveal corporate crisis? There was a time when I hoped to change the world by working in university student services. The central idea of that profession is that students learn much more in college than what is taught in the classroom--that schools have a duty to maximize learning through the student's experience in housing, activities, recreation, campus health care, and career planning. I came within a few course hours of completing a master's degree in Student Personnel, the formal name for the field. The academic study includes a lot of human development theory, especially the ideas of American psychologist Abraham Maslow. 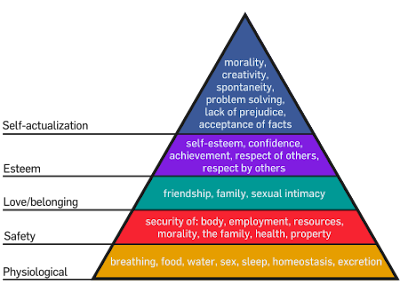 Put simply, Maslow said that humans have a hierarchy of needs; if basic needs like food, shelter, and safety are not met, people are unlikely to seek out higher needs like achievement and self-actualization. The ordered list looks like a pyramid. We can also look at Maslow in other contexts. In that sense, his theories quickly begin to reflect our worklives, and the dynamics of organizations. Basic employment is a foundation need. But one level from the top are self-esteem, sense of achievement, and respect--by and for others. Those are critical elements of a high-achieving business, but much of what people experience at work is different. 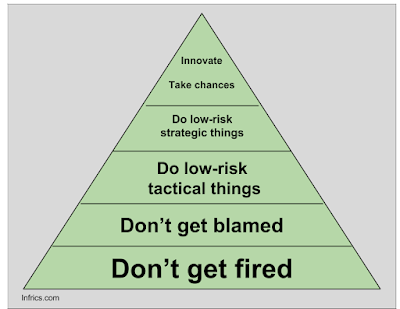 The same dynamics that lead to all the internal corporate fiefdoms, to the proliferation of administrative levels, and the big change management issues are firmly rooted in Maslow. Back to the headline of this story: I contend that a good part of your inability to get good data is that your culture operates at the bottom levels of the business pyramid far more often than it does at the top. Because reporting data with other than good news represents a risk--taking a chance--there is a built-in bias toward data giving you a false positive on good news. In "American Icon," his excellent 2012 book on Alan Mulally and the turnaround of Ford Motor Company, Bryce Hoffman tells the story of one of Mulally's first breakthroughs, getting his executives to report bad news. The entire exec team met weekly to look at company performance. Mulally's system used a simple green-yellow-red color coding on each VP's report slides, but week after week, nothing but green appeared. Hoffman continues: "By October 26 (of 2006,) Mulally had seen enough. He stopped the meeting halfway through. That was because nobody believed Mulally when he promised that honesty would not be penalized. In the past, high-level meetings were arenas for mortal combat at Ford. Executives entered the room with keen eyes, searching for flaws in one another's plans. They examined their own presentations beforehand like generals surveying their lines for weak points. They were sure Mullaly was trying to set them up, and none of them was foolish enough to fall for such an obvious trap." I'll skip to the conclusion, someone had to take a chance. It turned out to be Mark Fields, the VP in charge of North America. The new Ford Edge had experienced a potential problem, just days before it was supposed to ship to dealers as a brand new model. Fields reluctantly decided to hold the new model launch. And he decided to honestly report a red dot on his report for the upcoming executive meeting. Hoffman describes how that played out: "As his turn approached the next day, Fields figured he had a fifty-fifty chance of walking out of the room with his job. By now, he assumed there was a good chance he was going to lose it anyway. Somebody has to figure out if this guy is for real, he thought as he studied Mulally, trying to divine his mood. If I go out, it might as well be in a blaze of glory. Fields began his overview of the business environment in the Americas. He called for the slide showing the region's financials. Then there it was--the product program slide. Fields tried to be nonchalant. There was dead silence. Everyone turned toward Fields. So did Mulally, who was sitting next to him. Dead man walking, thought one of his peers. I wonder who will get the Americas, another mused. Suddenly, someone started clapping. It was Mulally"
Ford went on to survive the economic crash of 2008 without declaring bankruptcy, and without a government loan. They went from a $12.7B loss in 2006 to break even in 2009; in 2015, Ford reported a record $10.8B profit. Mark Fields succeeded Mulally and is now the CEO of Ford. I think there are several good lessons here. First, even if you are measuring the right things, there is a chance that the Maslow effect is giving you incomplete or inaccurate data. Second, your enterprise success may depend on Maslow and others in areas not usually thought of as business drivers . It's difficult to overstate the importance of executive leadership in creating a safe place for bad news, because the issues you don't see are the issues you can't address. Whether you lead a department, a division, or an entire company, that culture flourishes top-down. "Garbage in, garbage out" is a metrics maxim. And it applies to leadership as well. 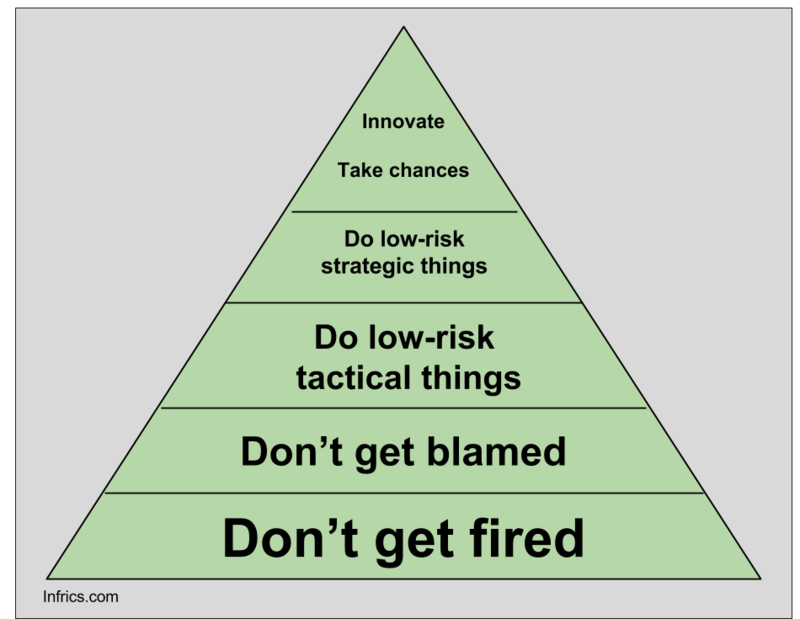 Change that culture, and Maslow will know you have risen to the top of the pyramid.